Not about painting; painting itself, a relief. And yet, not the inspiration of one bright sunny morning last week. Rather, the business of reworking, all windows open to the salt air of the European Renaissance, Italian Flemish, calmly assimilated with a medieval care that commands respect. A new preciousness. Rationally at war with the machinery of rationalism. The objects re-occur. The masks. As with Vermeer, the appreciation of one painting is enhanced by an interrogation of the others. We become familiar with the enigmatic interior, mask, scales, antique illustration or text, books, drape.... vision, in homage to the absent 'Astronomer '? Fruitless or fruitful, each mask an echo of girl with something. Girl with Violin, rather than Girl with Lute. Girl with Dead Fish instead of Girl with Turban? Object and dummy. 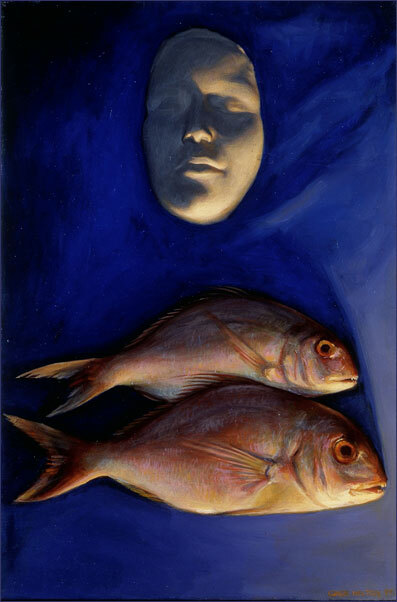 In these paintings the mask is both object and dramatis persona. 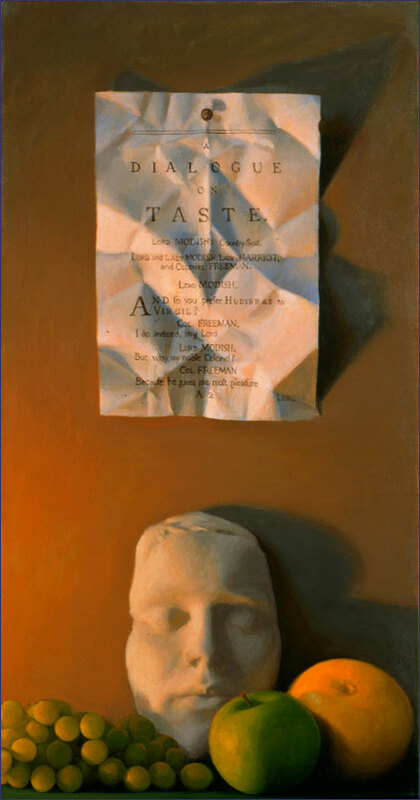 An object for painting like any other, but selected by the artist to figure within a 'nature morte', it becomes an emotional emblem, as personal as the portrait of any face somewhere between death and life. Moving, how, or why, I cannot say. 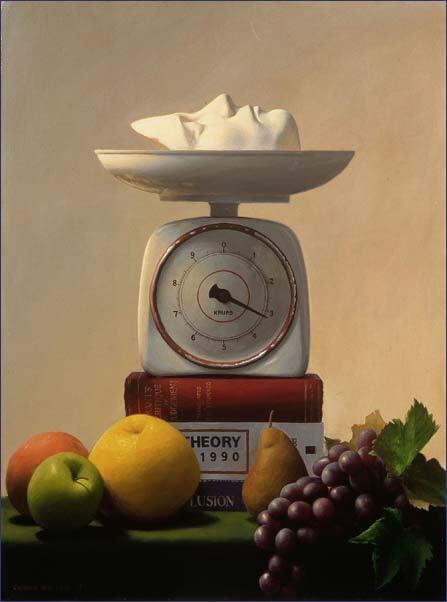 Here a hybrid form born of 'nature morte' and 'portrait'. For, as I recall, the human face at its most individual, the sleeping face of a child, does not traditionally figure among the domestic fruit and culinery display. Facing us then, neither life nor portrait, and yet, portrait and life, still, together. And in each work, the mask object seems to underline that stillness, life stilled, distilled into an elegy for the little left, the Face of Things. Even the fruit is pervaded not by any pre- or post-digestive satisfaction, but by a sense of post-life, a sort of plastic verticality where no movement is possible, each colour, each text, each title mounting to a monochromatic silence. Still life, wherein 'still' were adverb more than adjective. And just as in Vaughan Williams' 20th century 'Fantasia' we can hear the theme by Thomas Tallis, who doubtfully had any magnificent English landscape in mind (let alone for two string orchestras), in all of these still life paintings, we hear the tolling of the allegory of Vanity of Vanities. The reoccurrence of objects. The kitchen scales, for example. Not the Middle-aged St Michael weighing the souls of the dead, with mature Christ in Last Judgement. Nor as a detail. In Conor's first memorable portrait tableau, a wide evolutionary Velasquez space of humans, monkey, ape and domestic dog, just out of the light, a cat is about to be weighed. Here the scales reoccur centrally. Just one hand clocking up the surface deadweight of a face. Parody of Time and Progress, of Science, Measurement and Gravity, of crab-apple Newton and his colonial Empire of Empiricism, the bitter dawn of Judgement in a pocket calculator. In total opposition with the Euro illusion of Cartesianism and the Age, don't you know, of Enlightenment. With the bitter dawn of Psychology and the Human Species, God help us. Unlike the two Williams, here is war with the 'modern' occasion itself, with no apologies to alia et Cezanne, Dali, Warhol. There is even a bouquet of sunflowers without any apologies to Van Gogh, readily unmaking what papa Duchamp himself would have despised as plugging in cheaply to his machine à puissance timide. But the future of art, hence the Future itself requires no collective interview for a task, defined ad hoc on the basis of some evolutionary novelty. Here is merely accelerated matter as blue and as real as the provisional electrons of space that flow in through the atmosphere, falling into the oceans, to be washed up on the dunes or out onto the canvas, victorious over the corrosive sentiment of Surrealism. The futurist scent is equally strong in all the larger paintings. Over the sands of European ikon it has now been personalised, without the usual superstore spaceship bargain giveaway, or the waxy smell of the parishioner's candle of artistic devotion. The contemplation of the future invoked in the 'Ophthalmos' image of the child regarding the dark heavens under the maternal, almost ecological gaze of the woman, has all the blue peace and quiet of a Yeatsian Madonna and Child on the dim, dechristianising stage of the old Abbey. But the work has been done. In the dark. what the artist himself, are regarding. There is a also a dark breath of the Dark Ages in this painting of the 4th century Croat. With copyright on only the whole of the Latin Bible, St Jerome was patron saint of translators until the 1960's when Hiroshima 2 (correction, Vatican 2) relegated his writings to the local vernacularium. It may have taken time for Dublin to have a 'modern' Jerry of its very own, but it is, at least, one in which the giant Translator has not been confused with Gerry the legendary Lion Tamer (St Gerasimus), a different desert hermit. This has been frequently the case where St Jerome was given a Trafalgar-sized lion to pet, along with his Madrid cardinal's hat. What's more, Dublin's latest J (and not G) would appear to be correctly listening to the trumpet sounding the Last Judgement, and taking notes at that. As a life study, it re-echoes the elegiac desolation of the still life group, but up in volume here, in full frontal profile, a kind of noble 'sean-nós' sadness. The startling nakedness of age! Those who had scrapped their scapulars may be pleased to see the return of St Christopher, who otherwise might have required no introduction before being purged from the calendar by his present Holiness. Rehabilitated is the responsibility of guardianhood, bearing upon his shoulders, not only the child, but also the weight of the world. 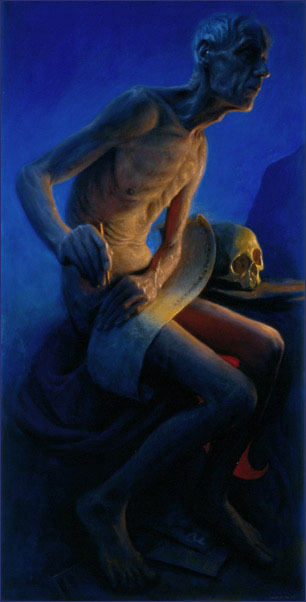 It combines a personal portrait with Christian legend in a futuristic if somewhat anxious light. That these paintings form an 'oeuvre' and a personal code located somewhere between vision and language makes it no easy task to disconnect one image from another, nor indeed each from its own textual enigma. In directing images to book, title, quotation and European ikon, this artist may be guilty of tediously intellectual nicety, if his priorities are more with the image he is seeking. He is clearly distancing himself from last Sunday's art, a code with little or no concern for the ikon-omics of the whole shining history of Western Art and Science. The absent astronomer-physicist of the mind? It may not just be a matter of restoring the explicit role of scientific thinking to the visual artist, and thus doing the visual arts a service. It may not just be a matter of restoring thought to the eye. It may also be a matter of integrating the business of knowledge into any 'vision'. Vision - the word that reoccurs. For in the simplicity of these images and these words, a dialogue emerges: with the onlooker. Between them is a code where 'words' become objects as silent as the heavenly skies or the earthly shelves, as mysterious and still as the masks and human figures, all looking into distant text. Longitudinally or latitudinally, there is a fascination with the business of looking at Time, at Text, at the capacity of both to deaden. The pan-downward Apocalpse crowd of 'Then we upon our globe's last verge shall go', a strikingly spherical return in the night to that memorable first evolution tableau. 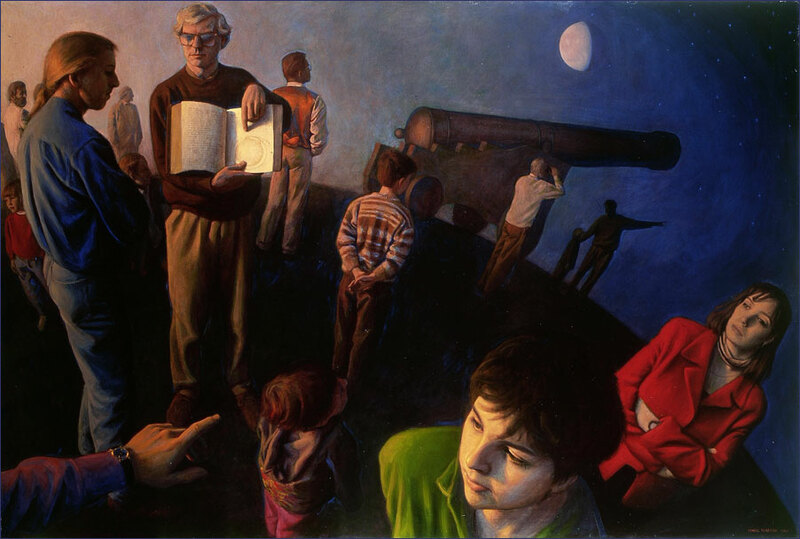 The artist, Conor himself, is represented in this painting looking into a textbook held open by a modern high priest, tutorlike, at some science fiction liturgical occasion. Vision is yet again presented as a glimpse into the textual sense of Time. Perhaps, like Boethius in prison awaiting to be beheaded, the artist has not looked at Christianity or at any faith, but at his own text in the mind. In this allegorical painting, Philosophy herself seems to offer a cold hand of blue Consolation to the onlooker, reflecting (on) a very deadening view of Time, as, out of time, we look at what we see. Five elements arranged carefully, giving the impression of a spontaneous setting caught negligently on the ledge of a study. High up in the familiar long rectangular frame, a single tack pins a single delicately-creased old-edition print to a flat brownish monochrome surface.This enigmatic print, as if torn out of a book, mishandled, has been pinned up like a note on a wall, a wink at some intellectual exercise in the past, or a reminder for the future, to compete with the flat and endless spatial surface of that wall. The words 'DIALOGUE' and 'TASTE' are quite clearly legible. In terms of pure geometrical arrangement, in their dim-bright contrasts and colours, the objects themselves as painted are fascinating. Even the texture of the page more than adequately challenges the delicacy of the traditional drape. Space is everywhere, a wide-rimmed square around the page in the upper thirds of the rectangle, and a fallen multi-surface triangle of mask and fruit massing the base. But language and painting at odds with each other. The page draws the reading eye in to get the 'words'. Yet the soft oval of the facemask is speechless, lifeless, inhumanly hemmed in, surfacefully flat. Threateningly flatter than rich rounder apple, than elliptical grapefruit. While the fruits will satisfy the eye of any vegetarian, mask and page desalivate any watering palate into contemplation of a somewhat dustier, Presbyterian dessert for the soul, to close all mouths and silence all tongues into a sepia stillness. 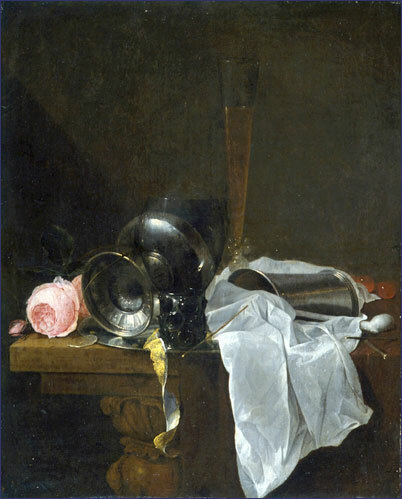 As a metaphor in the Leyde genre of 'Vanity of Vanities', as an allegory in the painted sense, this 'nature morte' opposes De Heem's 'Nature Morte á la Rose' . As I recall, pink roses, one fading fast, lie horizontally in the dark with, disorderly, horizontal goblet, thimble and two glasses on a table, the whole dominated by a half-discarded richly crumpled white table napkin. De Heem's meal is over. Equally, the fleeting pleasures of life, save what is saved in stillness by the artist. Everything here, however, points to a more vertical sadness, an angrier lucidity, where thought is at the mercy of pure colour and chemistry. Each object more speechless than the next. Hyper-elegy alone, sparseness without the sneer, sobless. Martin Walton, Conor's brother, is Senior Lecturer in English at the Université Montesquieu, Bordeaux 4, France. An earlier version of this essay accompanied Conor's first solo exhibition in 1999.